The threat of the climate change crisis and living in a world of diminishing resources can often lead many to ignore it or succumb to denial. Wherever we place ourselves in the hierarchy of sustainable lifestyle actualization, it can be hard work to change habits, alter how we socialize, exchange, share, educate and build our identities. In order to transform our lifestyles and communities and live in harmony with our natural environment, we need to start with us. 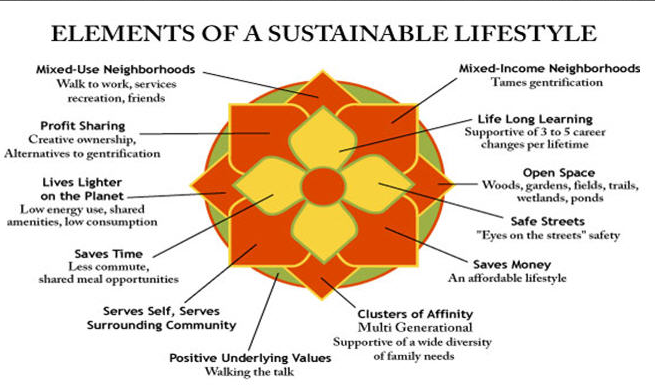 So what is sustainability and the sustainable lifestyle? This year we will educate and enable you to live a healthier, enriching, sustainable lifestyle. We know you can do it. We have, and we continue to learn and do more. In 2012, when we started TerraBluTeams, we began with a 52-week series of sustainable “exercises”. In 2015 we ask you to start a 52-week sustainable lifestyle design challenge that will inspire you to manifest weekly changes to reduce your footprint, connect you to your community, bring you closer to family, friends, nature and animals. By the way, you will also save some money and have loads of fun doing it! If you follow this website, every Wednesday you will receive a new weekly challenge covering a sustainable lifestyle design choice. The Why, What and How will enable you to explore your choices and the Deep Dive gives you links to sustainably related education videos (for adults and children), sustainable art, sustainable product resources, scholarly articles, prizes, rewards and other information sources. Just follow us by clicking the button or entering your email in the column on your right. So are you ready to begin? Let’s get started!